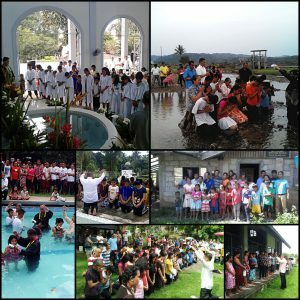 Hundreds of precious souls have accepted Jesus through baptism last January 2017 as results of crusades, home visitations, small group work of adopted ministers and brethren in the Philippines. Adopt a Minister was able to send only half of monthly stipends since December due to low funds. We are praying that our sponsors will continue to be abundantly blessed so we can continue sending support to the hundreds of adopted ministers. From: Reva Moore (President of Adopt a Minister International). NOTE: After living with our son for almost 5 months after we lost our home/office/cars in the epic Louisiana Flood of August 2016, we had finally moved to a rental house (Praise God!). Our loan application with SBA has been approved. However, it will take a long time before our flooded house will be fixed because of the short supply of carpenters and building materials. But we continue to do our work looking for support for the hundreds of adopted ministers. Thanks so much for your faithful support through prayers and funds. Please help the work to share Jesus through the work of the adopted ministers. You may send to: Adopt a Minister International, 7811 Laurel Court, Denham Springs, LA 70726. Thanks so much and God bless you!